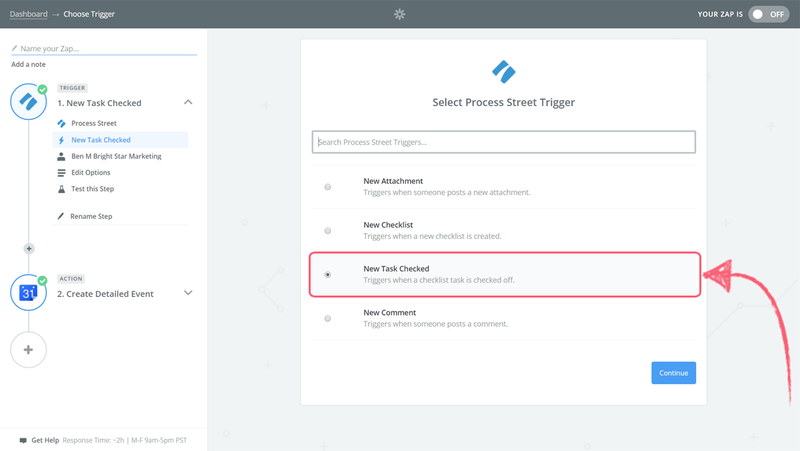 You can integrate Google Calendar with Process Street checklists using Zapier. Data you capture in Process Street checklists can be used to automatically create events in Google Calendar. That means you can record information as you work through your checklists, and then automatically create and/or edit events to keep your schedule up to date. 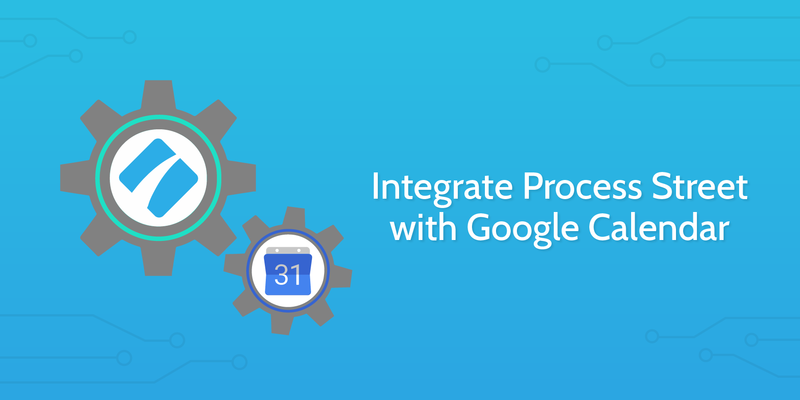 If you’d like to know more about automating your processes in general, check our our free business process automation guide. Let’s get this set up! First, we need to add form fields into our client onboarding checklist in Process Street. These can be used to record data when working through the checklist, which we will later push into Google Calendar as a new event. The gif below shows how to add form fields while editing a template. Add form fields to your own checklist to let the person working through it record important information (such as the elements above). Think of everything you’d like to transfer to your static employee onboarding records in Google Sheets, and add a form field for each to be captured. After that, it’s time to make sure that your spreadsheet is set up and ready for the information to be pushed through. 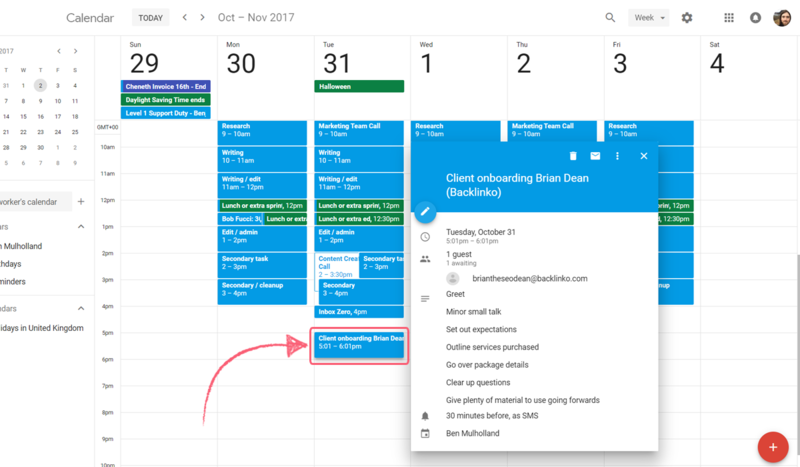 Next you need to make sure that your calendar in Google Calendar is set up and ready for the information captured in your checklists to be pushed through. There’s not much to this step, other than that you’ll need to have an account set up and (depending on your preference) have a separate calendar in place to track your client meetings. If you have a Google account then it’s as simple as logging into the Google Calendar site with it. 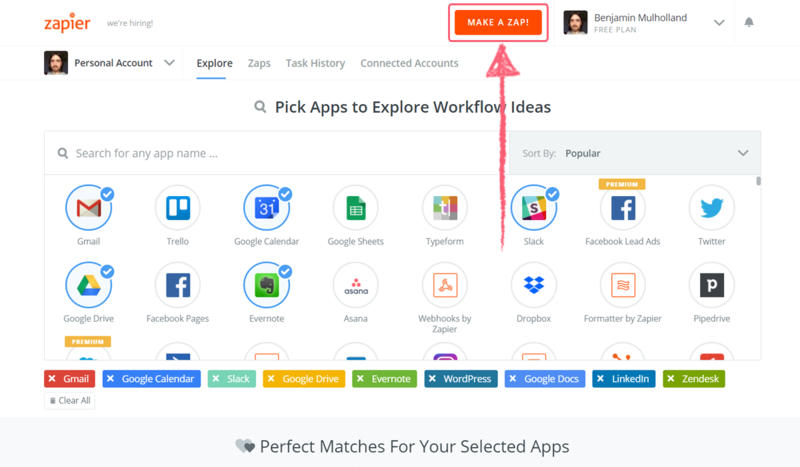 Zapier is a tool that connects over 750 different apps. Any action in the supported apps (like forwarding an email or adding an attachment to a task) can be set up to trigger another app’s features automatically. Zapier integrates with both Google Calendar and Process Street. The whole recipe (Trigger + Action) is called a Zap. Connect your Process Street account, and move onto Edit Options. From the dropdown menus, choose the template and task that contains the form fields from earlier. Before you go on to test the step in Zapier, make sure you’ve created a checklist, filled in the form fields, and checked off the task that you’ve set Zapier to detect. This way, Zapier has some test data to pull in and validate. Congratulations! You’ve just set up Process Street as your Trigger for the Zap. Next it’s time to set up Google Sheets as the place where your Action will take place. 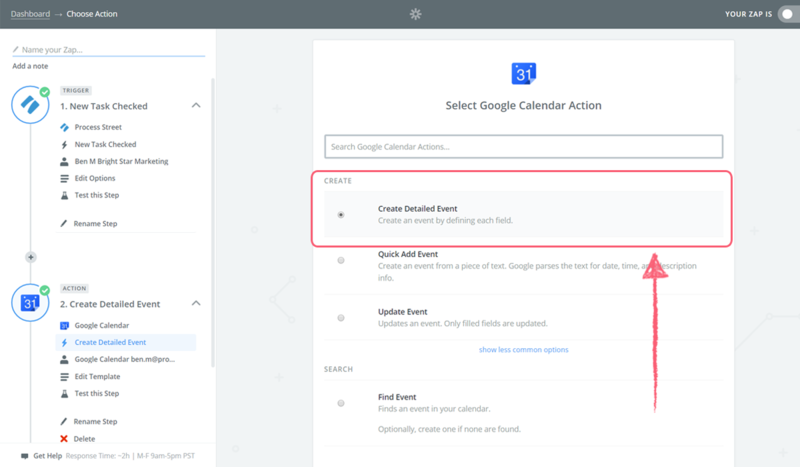 Choose Google Calendar as your Action app and “Create Detailed Event” as the Action. 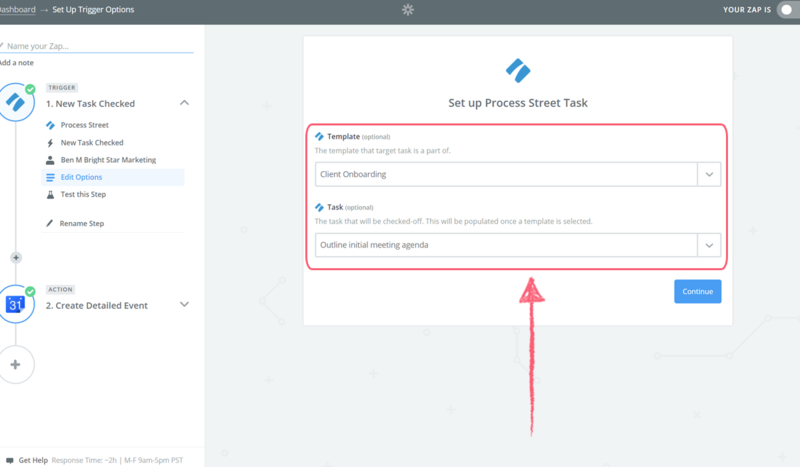 This tells Zapier to create an event in Google Calendar when the task you previously selected in your Process Street checklist is checked off. Connect your Google Calendar account and then move on to setting up the template for the event that will be created. The only required elements you need to fill in are the calendar you want to use and the start and end date of the event. Now, we want the start date of the event to be the value recorded as our “Initial meeting date” in the client onboarding checklist. To do this, we have to push the information into Zapier as a custom value in the “Start Date & Time” field. This can be done by clicking the “Insert a Field” button to the right of each entry, and then using the search bar to enter the name of the checklist form fields to find the right data to link. For the end date you’ll also want to add a “+Xh” after the form field data (with a space between them), where X is the number of hours you want the initial meeting to take. Once you have your own Zap set up, continue through to the test phase, complete this, then head over to your Google Calendar to make sure that your event has been created. Once that’s done, name and save your Zap, then test it out again by creating a new checklist, completing the required form fields, and ticking off your Trigger task. Make sure that the event is created correctly with all of the relevant information in the right place. And there you have it! Here’s to saving time and energy that’s better spent on your more important tasks.